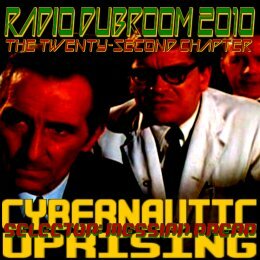 WWW, December 2010 - In what is (one of the) last podcast(s) of Radio Dubroom 2010, we're partially looking back at some crucial Steppers selections plus a couple of brand new tunes. Vocals and Dubs, a lot of Dubs, over 90 minutes long! One thing is certain: the year 2010 ends more turbulent than it started. JAH's Revelation Time in full swing, if you will. Obviously this is also felt by the workers of (DUB) Reggae music, as this musical upliftment to the Conscious Cybernauts clearly shows. Steppers from the top to the very last drop, extra bass and effects, everything mixed live into this 90 minutes of heavyweight stuff.